This webinar is being provided in partnership with the AIA Historic Resources Committee. A live on-site event will be held at the AIA San Francisco Chapter as well, but this registration is for the live broadcast of the event. To register for the on-site event, visit the AIA San Francisco chapter here. Adam Arenson will present the research from his new book, the first book-length study of Millard Sheets’ architectural commissions, including the marquee branches of Home Savings and Loan throughout California and beyond. Connecting Sheets’ work to precedents, including California world fairs and Rockefeller Center, it continues past the sale of Home Savings to Washington Mutual to explore the preservation challenges for this work today. It explores the workings of this “California Modern” studio that included not just architects and interior designers but painters, sculptors and stained-glass artists. Some of Millard Sheets’s original color renderings of the Home Savings buildings will also on display. Some of these renderings are included in Arenson’s book, and he will explicitly describe their role in the process of meeting client and zoning-board expectations when siting and constructing these buildings and choosing the themes for their artwork. 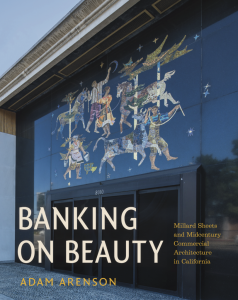 Combining urban history, business history, and art and architectural history, Banking on Beauty is based on more than seventy oral history interviews, archival research and site visits.